One day, one year, it was in the 1980s I remember that, I was listening to Little Feat’s “The Last Record Album” with a friend. I made the blindingly obvious statement that Track 3, “Long Distance Love”, is as good as a song as any I had heard. “Yeah”, said my friend, “I was in the studio when they recorded it”. What the….! In 1975 Clive’s musician brother was preparing a live LP that would sell by the lorry load, the best selling record of 1976 in the USA. He got to see some Rock & Roll places, do some Rock & Roll things so he was probably telling the truth. If he was making the story up then that’s OK. Go big or go home, a day in a studio with Little Feat back then was as big & as good as it gets. “The Last Record Album” is the 5th LP by Little Feat, formed by guitarist Lowell George & keyboard player Bill Payne in 1970. It’s an album I love. Back in the winter of 1976 I took a month off work for rest, recuperation & hibernation. Every afternoon, my house husband duties done, I lit one up & listened to this record. It’s not Little Feat at their very best, individual talents demanded & deserved a greater in-band democracy at the expense of the slitherine, swampy rhythms of their earlier work. The ominous funk of the final 2 tracks, “Somebody’s Leavin'” & “Mercenary Territory”, really tie the album together & they still chill. 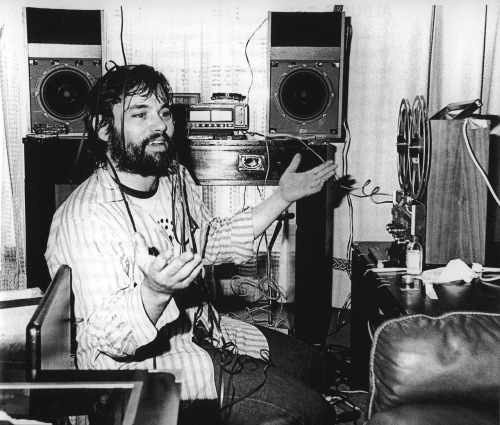 Lowell George, the predominant songwriter, contributed only 3 songs of the 8. The poignant life-on-the-road, almost-country ballad “Long Distance Love” has a simplicity & an instant attraction. Lowell had previous. One of the delights of any Little Feat LP was his quieter, reflective, emotionally honest songs which needed little more than his affecting slide guitar as embellishment. Back in Hollywood in 1970 Lowell, already with a rep as a fine slide guitarist, was a member of the Mothers of Invention. He presented Frank Zappa with his song “Willin'”, a trucker/stoner anthem. “Give me weed, whites & wine & you show me a sign, I’ll be willin'”, you know it. Frank wasn’t about to record a song about dope & Lowell was shown the door. More likely “Willin'”, a song so good that Little Feat recorded it twice, indicated that it was time for Lowell to get his very own thing. The original Little Feat quartet had an idiosyncratic take on the Blues with a little country & rock & roll seasoning. Along with “Willin'” the regretful “I’ve Been the One”, made more plaintive by the lonesome pedal steel of Sneaky Pete Kleinow, cooled down the sometimes hectic pace & marked the arrival of a deft, precise songwriter. The 2nd record “Sailing Shoes”, added a little more West Coast polish to their sound. It was a critical success (because it’s a stunning record) but I guess that if you make one of the great opening tracks to an LP, the storming “Easy To Slip”, throw in lyrics concerning marijuana psychosis, then you have no complaint when it becomes one more song the radio won’t play. The narcotic title track, a reworked “Willin'” & the remarkable, accurate, funny even surreal “Trouble” are of a piece on this LP. “The footprints on your ceiling are almost gone”…what a line & where did that come from ? Robert Palmer, with the help of some of Feat & the Meters funked the song up & some of the subtlety was lost. The later version by Lowell’s daughter Inara & Bill Payne is a stab of beauty. For “Dixie Chicken” the group was remodelled into a sextet. A new bass player, an extra guitarist & some congas provided an injection of funk & made Little Feat a killer live band. Individually they had the imagination & ingenuity of a jam band, collectively their insinuating, infectious rhythms were irresistible. Lowell took the lead on “Dixie Chicken” with a collection of fine songs. The quiet one, “Roll Um Easy”, was sweetened up by Glen Campbell & a good job he made of it too. 1974’s “Feats Don’t Fail Me Now” was missing one of his solo efforts but no matter. Here was the sound of a band at its peak, the whole greater than the sum of its parts, a consolidation aiming to boogie your sneakers away & succeeding. I spent the summer of 1979 on a Greek island. Back then the homogenised Eurotrash holiday “culture” was yet to reach our isolated retreat. There was a small club, we once heard Ian Dury being played, breaking the chain of Bee Gees hits, but they were, you know, not our kind of people (a-hem !). I loved the place but there was no music, bouzouki on the radio, the Walkman hit the shops while we were away. There had always been a soundtrack to my life it was strange not having one around. One night in a beachside taverna I was talking to a young Scandinavian who read the British music press but not between the lines. I told him that, out of it all, I missed Little Feat & Steely Dan the most. He told me that Lowell George had died 6 weeks ago. It should not have been too much of a surprise. His rock & roll habits were taking a toll, obviously out of shape, his contributions to the band he formed diminished. After over 15 years of obsessive listening, of paying too much attention to the minutiae of Rock’s Rich Tapestry, the shock was more just how long this bad news had taken to reach me. Man, I had never been so far out of the loop. On returning to England I found punk’s little brother Two Tone all over Top of the Pops. The bloody Police too (not on my watch mister). The end of the year was marked by “Fear of Music” & “London Calling” & there was a new Lowell George solo LP in the shops. “Thanks I’ll Eat It Here” was released just days before his death. It’s a record that covers the many fields of his varied musical interest & as such can take its time to reveal the concordance between the cover versions, a re-recorded Feat classic, the experiments & the extensive personnel. It is though a lovely piece of work marked by the charm, humour, talent & personality of its creator. Thank goodness it is because it’s the only solo LP we were going to get. It includes the last great Lowell George song. “Twenty Million Things”, another of his short, oh so sweet anthems for the lovelorn slacker. A little beauty & we all need some of that. Little Feat completed an album after Lowell’s death & then stopped for 10 years. He, of course, died too young, just 34, but heroin is the meanest drug I know & it’ll get you if you’re not more careful. The music he made with his bandmates across the 1970s is everything I want from rock music. It’s greasy & groovy, it surprises, it’s not too serious, it’s for the head, heart & the hips. Little Feat still don’t fail me now & Lowell George’s songs, whether rocking out or quietly reflecting, still hit the spot. Over on Facebook, that thing I use so that I can avoid talking to real people (they’re nuts !) but still fool myself I have a life, I get a lot of music thrown my way every day. Sometimes there are so many tunes & so little time that it is not possible to listen to it all. Of course if the selection is from one of my Band of Brothers I will give it the time of day but pressing “like” for a Captain Beefheart tune is equivalent to saying “I like breathing”…there seems little point in stating the obvious. Then there are things that make you go ” Oo-Ee-Oo ! That will do for me”. Today I heard this track from 1967 for the first, but not the last time. “Smile Let Your Life Begin” is by the Factory, a band from Los Angeles. It was their only release on Uni Records, a label which in the same year, 1967, had records by the Strawberry Alarm Clock, the Sonics, Hugh Masekela & the Osmond Brothers ! The Factory included Lowell George, the founder of Little Feat, the group who’s loose-limbed, melodic, stoner take on the Blues made them a Premier League outfit of 1970s American rock (maybe they held the title belt for a while). Richie Hayward’s there too, Feat’s drummer & a man of such rhythmic dexterity that when you saw him you felt the need to check out just how many arms he had. “Smile” has the seeds of Little Feat’s loping pace. They could dash along with the best but preferred to amble & still get there right on the beat. It is a pop record but it is not the Grass Roots or the American Breed. It’s kind of Sunshine Pop but these guys are sat under a tree somewhere waiting for the day to get a little cooler before they come out to play.I love 60s pop, I love Lowell George & this…? Guess what. More Cowbell ! In 1973 Little Feat recorded the “Dixie Chicken” LP which included “Fat Man In The Bathtub”. The serpentine blues slid into sinuous funk with their expanded rhythm section. That year Lowell & Richie played on John Cale’s “Paris 1919” masterpiece. With 3 great records they were bigger in the UK than in the USA. In 1975 Warner Brothers brought a raft of their bands over to Europe & at a noted London gig the Doobie Brothers were hooted off the stage when they followed the band the crowd were there to see. Friends who were there told me it was hilarious. We saw them in Birmingham in 1976, an incredible performance was improved by the capture of a maraca thrown by Lowell. My wife had very sharp elbows as the two guys in front of us discovered. So Little Feat were as popular in Britain as any other American group at this time. In 1977 they returned to play 5 sold out nights at the Rainbow theatre, the scene of their triumph over the Doobies. We took some time off work so that we could see the concert with our London friends. Man, we were so high that our driver baled on us early in our journey. A very dazed & confused Tube journey across London was in order, thanks Phil. So this next clip, I may have been there when it was filmed. If I wasn’t then I was in the very same theatre just days from the filming. The shows were not exactly a disappointment but there was tension within the band as keyboard man Bill Payne & guitarist Paul Barrere challenged Lowell’s leadership. No matter the band still hit the heights & “Spanish Moon”, backed by the Tower Of Power horns was plenty high enough thank you. In 1979 I left the UK for the Summer. For 3 of those months I lived in a small island village in Greece with, in those pre- Walkman (ask your folks) times, no soundtrack to my days. It was a little strange. Back home music was a constant & I had never been away from it for longer than a month before. Stripped of the choice & new sounds it was the music of Little Feat that I missed the most. 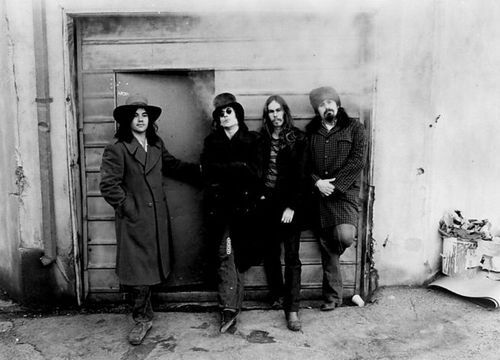 As I walked the cliff paths or got up early to watch the sun rise it was their tunes, that mix of blues,country, funk, New Orleans, their lyrics with a touch of surreal, stoned craziness that I either hummed to myself or shouted into the emptiness. “Fool Yourself“, that’s a good song. As I have written about all the great artists who are no longer around, their music always will be. There are so many great records with which Lowell George was involved. More later I’m sure. I first saw Robert Palmer live at a school dance. He was singing and playing bass with the Mandrakes.A decent band who played around the North of England. I did not really start to go to gigs until a year later & they were good. A couple of Traffic covers where he really stretched. He moved to the Alan Bown (Set) to replace Jess Roden but they were on their last legs really. Not gonna have any hits anyway. Then on to Vinegar Joe, Elkie Brooks & her husband’s rock band. I saw them, they were not very good. Certainly nowhere near Stone The Crows, fronted by Maggie Bell who really did rock. Elkie went off to cabaret & Palmer went solo. Hmm…nothing that went before showed a great deal of promise & there were a lot of good solo British rock singers in the early 70s. So the debut LP by Robert Palmer “Sneakin’ Sally Through The Alley” was on of the surprises of 1974. Here’s the title track. What about that ? Fantastic. An Alan Toussaint song, previously recorded by Lee Dorsey. The band is the Meters augmented by Lowell George. Enough pedigree to piss it at Crufts mate. This band played on 5 of the 8 tracks. On the other 3 it was the finest New York session men money could buy. Man, he didn’t know if he was lead singer of Little Feat or of Steely Dan ! Some choice. If it weren’t Zigaboo Modaliste drumming it was Bernard Purdie ! Another Palmer trademark can be seen in the video. He was usually seen in the company of an attractive woman, or later women. Island had obviously flashed the cash to make the record. Reached #107 in the USA. Everybody I knew bought it & played it to death. The 12 minute jam “Through It All There’s You” is a fine track. The 2nd LP was “Pressure Drop”, the title track a Toots cover. This time Little Feat were the backing band. In 1975 Feat were the best band in the world. The album is a little smoother than the first. A little less New Orleans, a bit more blue-eyed soul. The best string arranger in the biz, Gene Page,(200 gold records. Barry White’s man) was brought to slick up a couple of commercial soul songs. That’s Robert Palmer & Little Feat with another Allen Toussaint song. YOW ! Hey, what the… I was gonna take a track from the first 3 Palmer albums but I think we can stand 2 from “Pressure Drop”. The 1978 LP “Some People Can do what They Like” is a good record but it retreads the styles of the first two , not as well. Anyway we have to have the spectacularly cool LP cover on here somewhere. “Pressure Drop” reached #136, So no progress there then. One of the reasons is that there were no live shows to promote the records. It’s cool to get your cool mates to play on your songs but it’s too damn expensive to get them on the road with you. That’s one of the Page arranged songs. good quality audio but no sleeve. Here it is then. Palmer made 2 great LPs and then he made some good ones. He dropped the blue eyed soul and tried a touch of the gary numan’s for a while. Finally with more than a nudge from MTV and some slick vids he was successful. me I preferred the solo stuff he really wanted to make.